A week after accusing Israel of giving Al-Qaeda chemical weapons, anti-Israel British MP was caught lying about his remarks. A week after accusing Israel of giving Al-Qaeda chemical weapons to use against civilians in Syria, British MP George Galloway was caught lying about his remarks during a debate in Parliament. On Thursday, during a debate in the British Parliament on whether to take part in a military offensive against Syria, Galloway was challenged by Matthew Offord, a representative of Hendon in North London. Galloway was thrown out of the British caucus in 2003 after vocally opposing Britain’s involvement in the war in Iraq. He heads the British pro-Hamas Viva Palestina, which last year tried to bring in an aid convoy to Gaza but was stopped by Egyptian authorities. 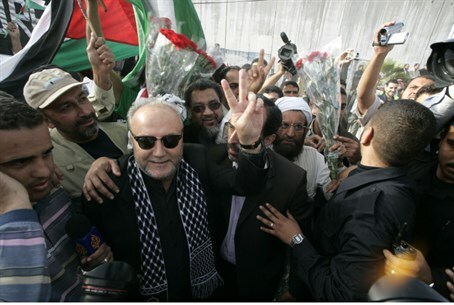 Most recently, Galloway stormed out of a debate at Oxford University after learning that his opponent was Israeli. He advocated that “Israel should withdraw immediately from the West Bank”, while his opponent, Eylon Aslan-Levy, claimed that a withdrawal should take place only as part of a negotiated peace agreement. After Levy used the term "we" to describe Israel's stance, a perturbed Galloway interrupted asking "You said 'we,' are you Israeli?" After his opponent answered in the affirmative, Galloway said, "I don't recognize Israel and I don’t debate with Israelis," as he stormed out of the room.